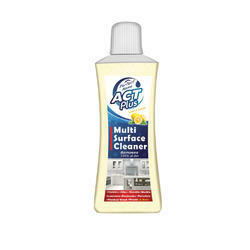 Pioneers in the industry, we offer act plus multi surface cleaner from India. Acts as a multi-surface cleaner where any surface which is cleaned only by water can also be cleaned. Suitable for Floors, Walls, Sinks, Food Contact surface areas, Kitchen Counter-tops, Tables, Shower Areas, Gyms, Garbage Bins and any other surfaces. Safe to use and Super Concentrated. Hence, Value for Money.